Trevor Neal, Teressa Foss, Katherine Gunnick, Maya Kherani. Mason Gates as Prunier, Elena Galvan as Lisette, Amanda Kingston as Magda, Jason Slaydon as Ruggero. Giacomo Puccini’s La Rondine (The Swallow) ranks among his least performed operas, but what wouldn’t, compared to his immensely popular war horses? 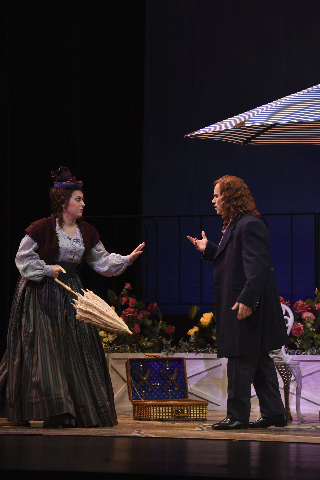 Opera San José’s captivating revival of its 2010 production demonstrates why this attractive opera deserves more attention. 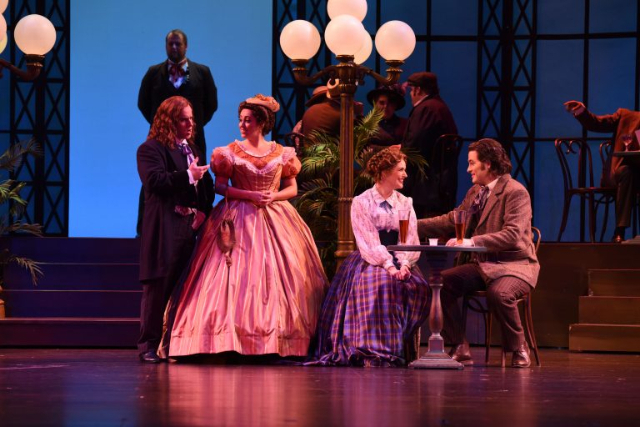 Its beautiful and accessible music and innovativeness make it a delight to hear, and its staging with three distinct sets in 19th century French style and period costumes make it a pleasure to watch. La Rondine is an outlier in the Puccini canon. If we dismiss his failed first full-length opera Edgar from consideration, Puccini wrote seven other multi-act operas, replete with violence and death. Interestingly, the title character in each is female, and in four, the heroine dies – La Bohème, Madama Butterfly, Tosca, and Manon Lescaut. In Turandot, all of her suitors until the final one are executed, and the sympathetic female character, Liù, commits suicide. In La Fanciulla del West, the heroine’s lover is a criminal on the lam who is shot but lives and also survives a lynching attempt. Only La Rondine is a straight love story, in which the most significant decision is how much to tip the waiter – until the closing moments, when suitability to marriage sets in. The music in La Rondine is ever melodic, light, and bright, whereas the rest of Puccini’s ouvre has significant periods of dark color. The reason is that a Viennese producer commissioned the piece as an operetta, albeit, without spoken dialogue. As World War I broke out before the opening, adjustments were made, and the premiere moved to Monaco. Some criticize the score as being too familiar, suggesting that the typical opera goer can take pleasure in it, rather than wondering why or how it should be “appreciated.” But the music can be enjoyed and also respected for its long melodic lines and particularly the use of various dance rhythms in motifs and full tracts, with significant use waltz cadence as well as fox trot. While the opera clearly fits in the Italian tradition, Puccini expands his own musical vocabulary with influences from French and Germanic sources. The libretto is rather trivial but provides sufficient entertainment with its characterizations and wit. Puccini struggled with the ending which fails to create sufficient drama, but two later rewrites of the culmination were also unsatisfying. Opera San José presents the original version. At the opening night performance, attendees may have been concerned that a sub-par performance was in the making as the production’s Magda, Amanda Kingston, seemed under powered. Happily, she soon revealed her rich, beautiful, and perfectly strong voice as she hit the lyrics “mad love” in the opera’s defining number, “Chi il bel sogno di Doretta poté indovinar,” (who could guess Doretta’s beautiful dream?) and later in “Ore dolci e diviné,” (sweet and divine hours) and in other highlights. But often, her dynamics remained too light to compete with the orchestra, as if she were saving her voice or didn’t have a good grasp of the acoustics. The tenor lead roles are the initially shy country boy, Ruggero, who will become Magda’s lover and Prunier, a center-of-attention poet who will fall in love with Magda’s maid, Lisette. Jason Slayden plays Ruggero, and Mason Gates is Prunier. Each displays great vocal character, with the former having the more lyrical voice and the latter having the greater power. 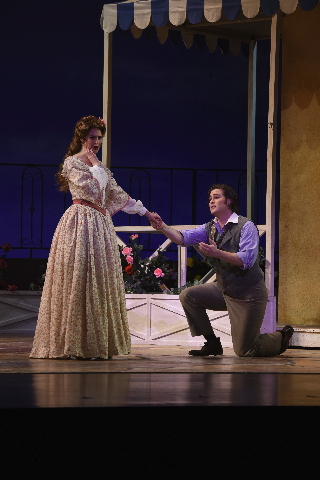 Elena Galván’s Lisette fills out the lovers’ ensemble. She is rapid-fire, witty, and penetrating, but with fine vocal quality. The event that brings the foursome together is the nightclub scene in Act II, one full of lighthearted deception. Although the club’s patrons are students and others of modest means, Lisette wears an extravagent gown of Magda’s without permission. Conversely, Magda, whose profession as a courtesan is unbeknownst to Ruggero, disguises herself by wearing modest clothes, fooling Ruggero and Lisette. The two couples unite to share the elegant and soaring love quartet “Bevo al tuo fresco sorriso” (I drink to your intoxicating smile). The whole act is reminiscent of the wonderful Cafe Momus scene in Act II of La Bohème, but this one has its owns strength and individuality. 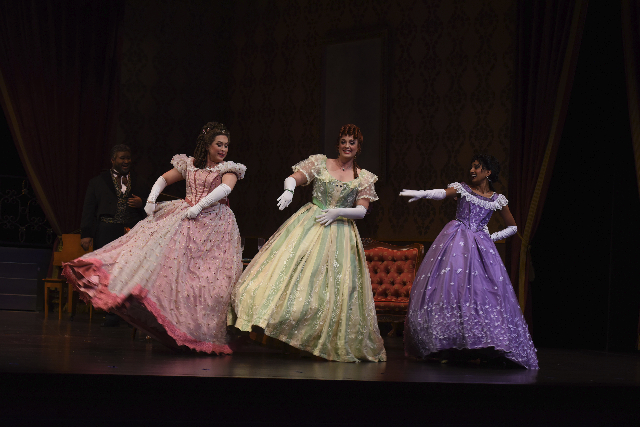 La Rondine offers a delightful evening of great music and effervescence, and Opera San José’s decision to remount it is wise. If its last few minutes lack gut-wrenching drama, just reflect on the enjoyable two hours that precedes it. La Rondine is produced by Opera San José and plays at California Theatre, 345 South First Street, San Jose, CA through November 26, 2017. Reposted courtesy of Victor Cordell.